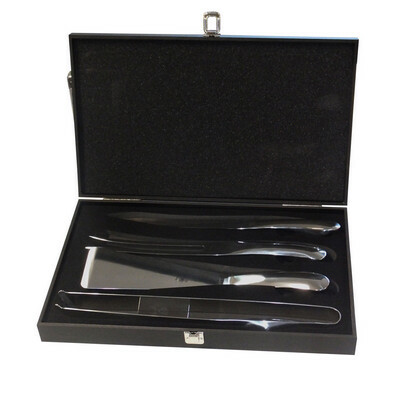 4 piece BBQ set containing polished silver Tongs, Fork, Knife and Spatula . Packed in a black MDF wooden box with EVA foam inner. . Includes stainless steel branding plate size 70 x 35mm. Product Size: 415 x 250 x 55 mm. Product Packing: Boxed. Decoration Size: 65 x 30mm badge. Decoration Position: Engrave on tools and branding plate, Print on branding plate or box. Decoration Method: Laser Printing | Screen Print. Carton Quantities: 6. Carton Size: 43 x 26.5 x 34.5. Carton Weight: 16. Colour: Silver/Black. Price includes : Laser Printing NA Colour / 1 Position. Setup is included.